In stock. Order in the next 6 hours, 4 minutes and it will go out today! 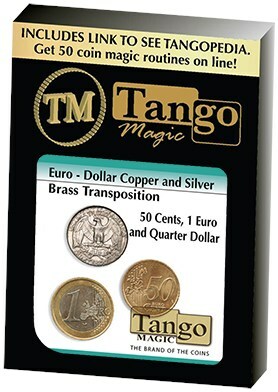 The magician shows three coins; a quarter dollar coin, a 1 Euro coin and a 50 Euro cents coin. He places the three coins in his left hand, closes the hand and takes a quarter dollar coin. Places it in his right hand, but incredibly when he opens the left hand, the quarter dollar coin is there and when he opens the right hand the Euro coins are there! The magician says he will repeat it, places the three coins in the left hand, closes the hand and takes the quarter dollar coin, but this time places it in the right pocket of his jacket. When he opens the left hand the quarter dollar coin is there again, then he asks for a spectator to place their hand in the pocket and removes everything in the pocket; incredibly the Euro coins are now in that pocket! Everything can be given out for examination.